Don Coleman of Blue Diving & Salvage LLC in Mobile, Alabama had quoted a big opportunity and wanted to change how he was going to approach the job. Don’s company provides inland / onshore commercial diving services along the Gulf Coast and had recently submitted a proposal to a condominium association for some dredging work along the inlet to their private marina. The requirement? 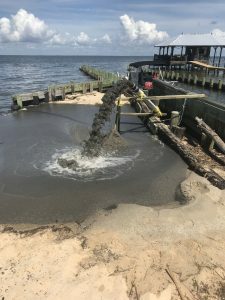 Remove an average of 30” of coarse sand from an area 220’ x 20’ at a depth of up to 5 feet so that boats aren’t scraping bottom on their way in and out of the marina. Deliver the sand 90’ away and build an area of beach back up where some erosion has occurred. In the lead up to hearing from the association that he had won the business, Don contacted Hydra-Tech Pumps to help him to determine what different options we could provide to make this job go smoothly. He was familiar with Hydra-Tech Pumps because he has occasionally rented for other jobs through some of the rental companies. After a number of phone calls and emails, Don had information on virtually every kind of 4” pump we manufacture – this was something that he thanked us for later. He said that it meant a lot that we took the time to go through the options and explain the technical differences in features, construction, applications and price on all of the different pumps without rushing him or abandoning him in the learning process. Don placed an order for a ductile iron 4” pump at almost the same time that he heard that he had been awarded the job at the condo association. Hydra-Tech built the pump in three days and shipped it to Blue Diving and Salvage on the fourth. Within a week they were on site and ready to go. The Hydra-Tech pump was suspended off of the front of the boat – the strainer was swapped out for a flange and fitting to get them to a length of suction hose and a nozzle that the diver would hold. 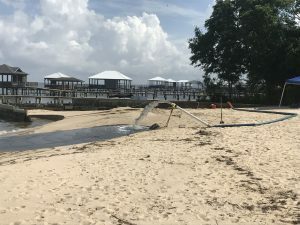 In two and a half days and about 22 hours of run time, the diver and the pump moved over 400 cubic yards of sand or a little over 18 yards an hour. The job was done and Don was happy with his pump and experience. The best surprise was still to come – when he removed the top from the volute to inspect the impeller for wear, it was minimal considering what the pump had been doing for 22 hours. We hope that Don will be a Hydra-Tech Pumps customer for a long time. If you want to check out his website go to www.bluediverllc.com. How can Hydra-Tech Pumps help your company to get the job done?